I've always said that the key to cutting edge fashion is to wear something ugly as sin and still look good. 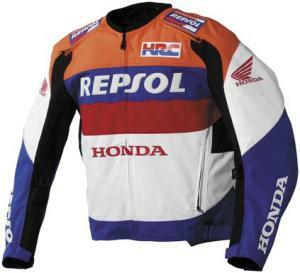 I'm not saying that Honda's Repsol textile jacket is ugly; it's just not a modern style. This is the kind of jacket you pull out of your closet after three years and say, "What was I thinking?" and then pull it out after another seven years and say, "Wow, this is awesome!" Right now, the Repsol textile is in the awesome phase. Pit jackets still have that 1970s look and will draw attention with bright colors and logos. Something about this coat makes it look a little appalling on the hanger but fantastic on the body. Maybe it's being so ballsy that you wear that many bright colors. The Repsol jacket, in case you didn't know, is homage to the Honda Racing Corporation sponsored by Repsol. The Honda emblems should tip you off to the association. The jacket is constructed of abrasion-resistant AT-600 and has CE-approved protectors in the shoulders and elbows. The Honda Repsol jacket is made for riding rather than pit work, so it has zipper vents in the front and back and reflective trim. All those colors will make sure you're seen on the road, regardless of that reflective trim.